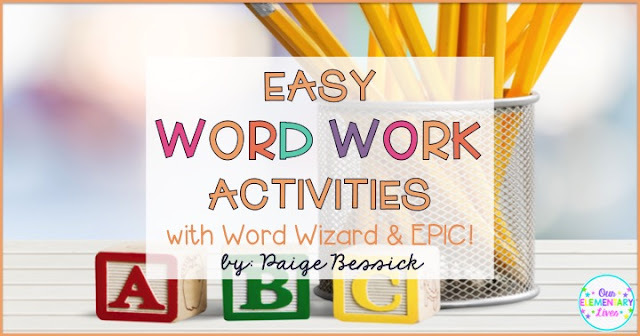 Easy Word Work Activities with Word Wizard and EPIC! Hello there! My goal this summer is to catch up on blogging. I have so many ideas that I want to share, it's just a matter of getting them all down. So, I'm starting with an easy one. 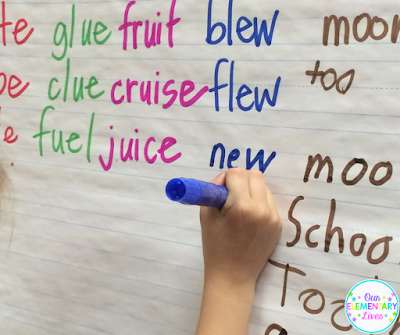 Phonics or word work, whatever you choose to call it, is one of my favorite things to teach. I love taking my first graders from writing and spelling 3-letter CVC words to teaching them word families, blends, digraphs and eventually long vowels at the end of the year. 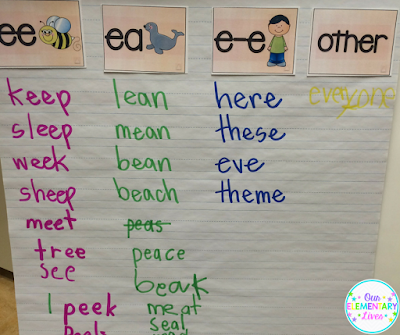 We do a lot of fun phonics activities but this is one of their favorites and one of the easiest to plan too. AND I see some of the best results after doing this with my class. 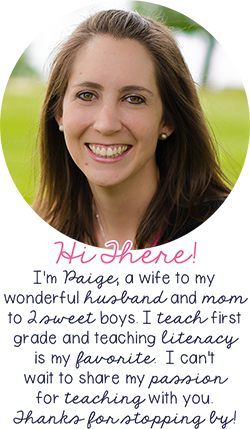 You can see how I introduce and teach a phonics pattern in this blog post here. I will typically do this activity after I have taught a skill and they have practiced it for a few days. We're going to use the LONG U pattern as an example throughout most of this post because the pictures I have are from when my class was working on long u. Before I had 1:1 iPads we used our letter magnet tiles all the time. I like the sets where each kid gets their own full alphabet. That way you don't have to hand out each letter to each kid. The only problem with these is that there are typically only 1 of each letter. If they are using letter tiles I'll give them a word like cute and have them make the word. 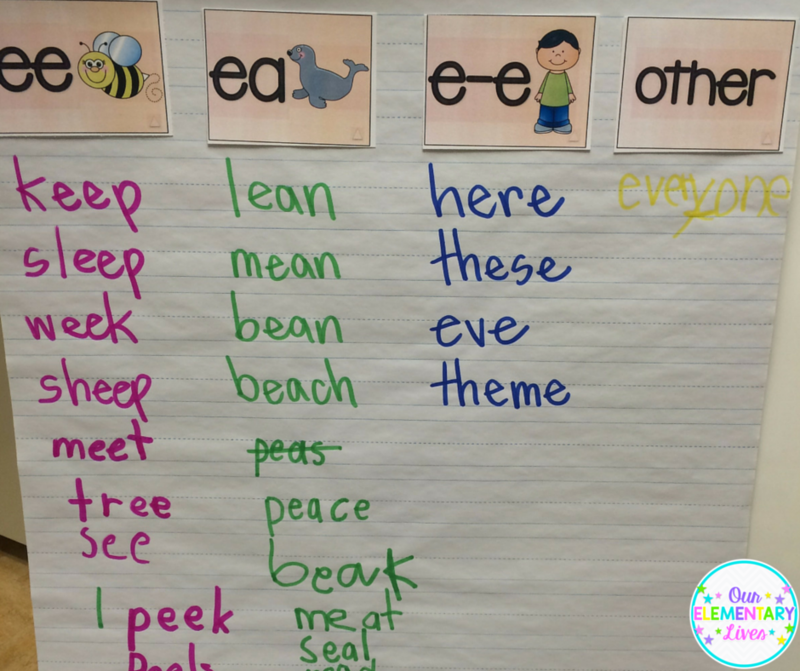 I'll be walking around the room monitoring that everyone has spelled it correctly and then I'll have a student spell it out loud for the class. Then I'll give them another word and they add or change the letters to make the new word. 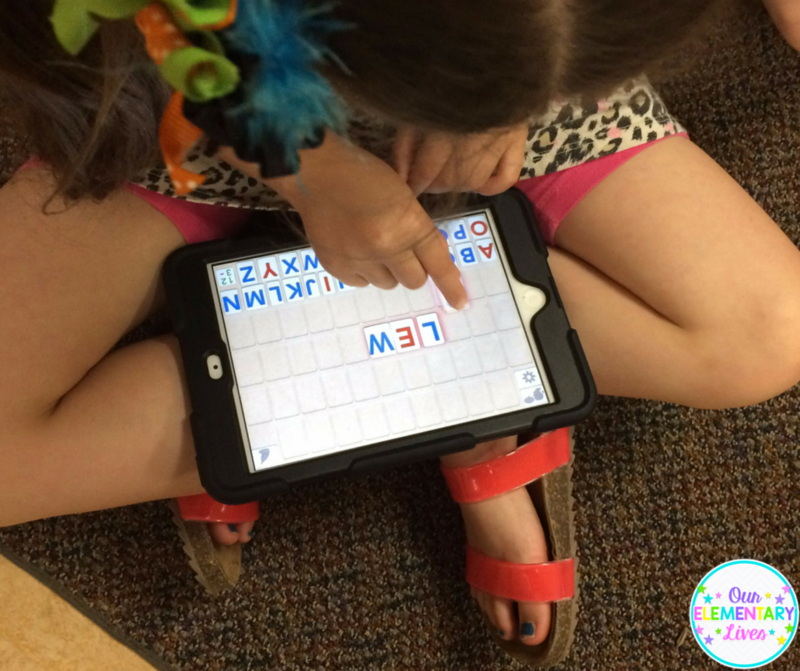 Now that I am 1:1 with iPads instead of getting out our letter tiles we use the app Word Wizard. This app has a movable, talking alphabet. If the word is a correct word it will say the word and light up white. If the word is spelled wrong and not a real word it will light up red. I usually have them do this on the floor, and then they will just turn their iPad around so I can see their word. I'll then call on a student to spell it out loud for everyone to hear. 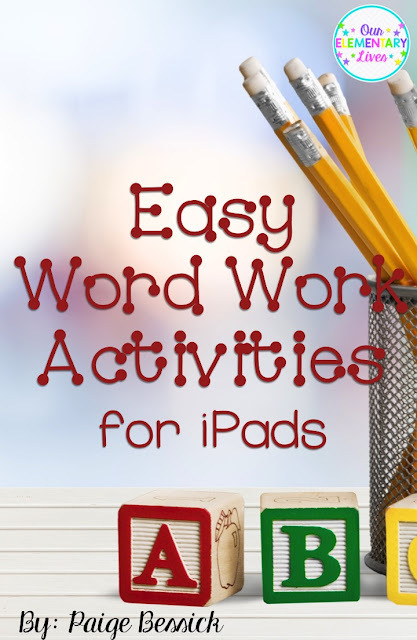 I'll then move onto the next word, but have them keep the other words they spell on their iPad so they can see a pattern. This is probably the least exciting, but will get the job done in a pinch. I'll give students a word to write like tube and then they write it. I'll walk around and monitor and assist them until they have spelled the word correctly. Then I'll call on someone to spell it out loud for everyone to hear. They can then erase or keep writing the words, it's up to you. I believe that having students manipulate the letters provides for better lesson so I will not typically have them write but this does work when you need it to. 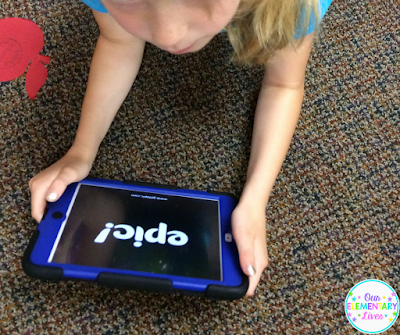 Here a student is using the app Word Wizard and making the word flew. 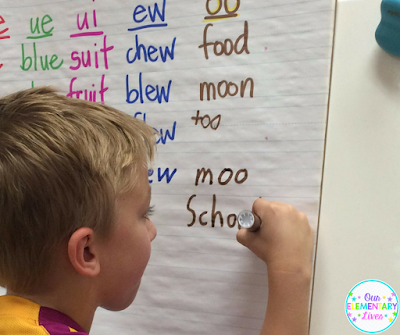 After each word I have them spell, I write the word under the correct phonics pattern. I stick with one pattern for 3-4 words then move onto another pattern. You can see an example from our long e poster below. I wrote the first 4 words, the kids wrote the rest (I'll get to that part in a little bit). 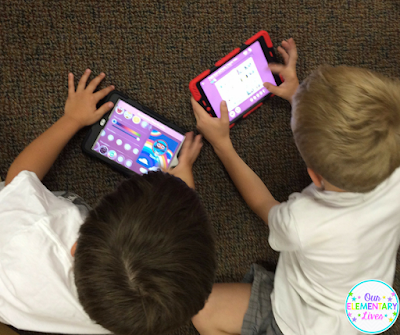 After we make the words, we keep out our iPads and use the app EPIC! This is one of my favorite apps that I will write a blog post on soon. For teachers, this is a FREE resource with FREE books that your students can read. If you're not familiar with it, definitely check it out. Anyway, the kids open this app on their iPads and pick out a book. As they are reading that book, or having it read to them, if they choose a read aloud book, they look for the phonics pattern we are working on. Even if each student doesn't have their own iPad, students can work with a partner or in small groups on iPads to search for words too. Here is a student reading a book on EPIC! Some boys reading their books and checking out their profiles on EPIC! If you don't have iPads or a way to view EPIC! you can have your students use any books for this. They can use books in their book bags or boxes or books you provide for them. Using the iPad always makes it fun, but regular books will work too. As students are reading their books on EPIC! they are searching for words that fit the pattern we just worked on, in this case, LONG U. When they find a word, students raise their hand, tell me the word, where it would go on our chart and then come up and write it with the correct color. This is the best part! 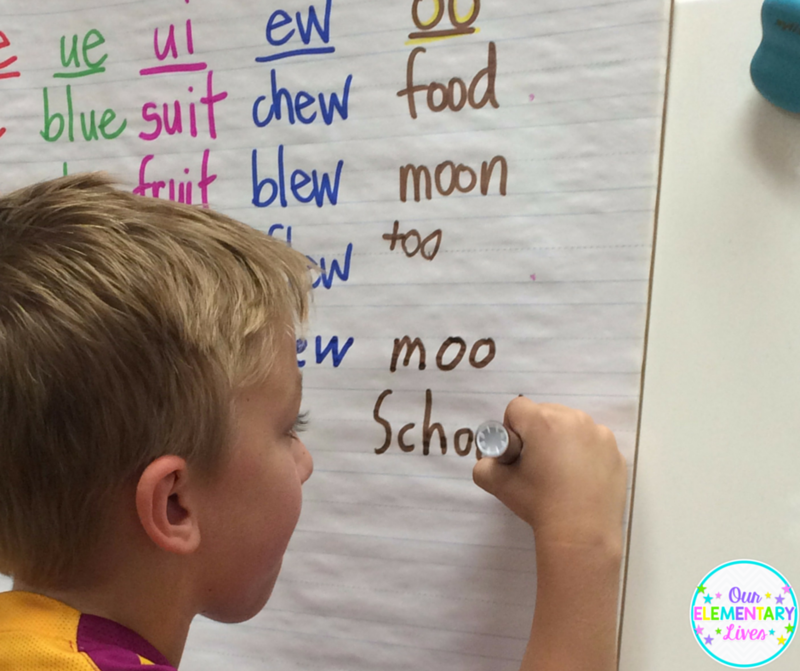 The kids LOVE to add their words with their own handwriting to our chart. I let them search for words for as long as we have time for and I typically like to find 3-4 more words for each pattern. Some are easier to find, like the oo pattern, so once we have a bunch, I say that pattern is closed and they have to search extra hard to find the other ones. It's a challenge and the kids absolutely love it! Here are several examples of students adding their words to our chart. You can do this with ANY phonics skill you are working on. 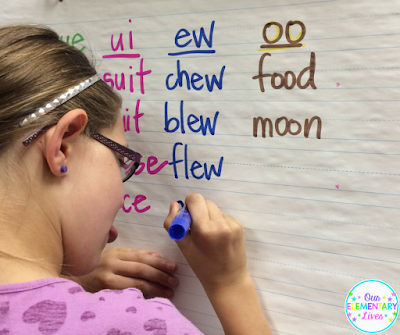 I use it at the beginning of the year for word families, all the way to the end of the year with our long vowels. It's great practice and the kids love it too! Click this image to pin. *I was not paid to promote the apps mentioned above. 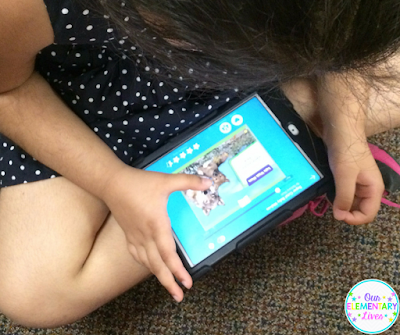 They are just apps we use in my classroom that I love.